Log on to Veeam Backup Enterprise Manager, using the account with the sufficient permissions (For more information, see Providing Access Rights). Go to the Items tab, then click Mailbox items. Enter the account of Active Directory user whose mailbox will be restored, or use search to display the list of mailboxes currently existing in the production environment. You can click on the search icon to display all mailboxes of the forest, or enter search criteria. 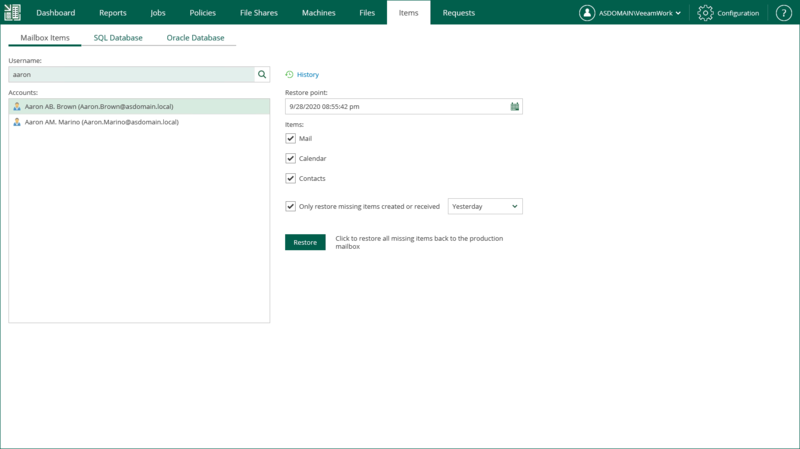 Veeam uses Global Catalog to examine Active Directory database and find the specified user mailbox, as well as the DNS name for the Exchange Server where the data should be restored. Then it looks for the corresponding VM backup or replica and its restore points. Restore points on tape are not supported (only those stored in repository can be used). Restore to another domain is supported within the same forest only. You can select to Only restore missing items created or received during the certain time period; use the drop-down list to specify the period you need. Сlick the Restore button. Items that meet specified conditions will be restored to the production Exchange Server. To view item restore session information, click History. Consider that using Veeam Backup Enterprise Manager you can only restore deleted items to the production mailbox. If specified mailbox does not exist in the machine restore point you select, then you will get a corresponding error message.